Bheem and team are all set in their funny and interesting costumes to celebrate new year but trouble emerges in the form of a mysterious box with a jigsaw puzzle in it. Raju, in the meantime, has a series of incidents where his luck favours him and it angers kalia. Winning the treasure hunt set in pehelwanpur becomes a big task due to a lot of cheats and Raju gets trapped in a balloon high in the sky. 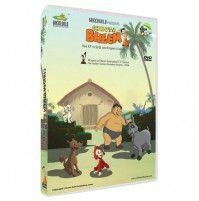 Watch Bheem tackle all these Challenges and emerge as a true hero in these amazing set of stories of Chhota Bheem.